Noble McIntyre was born in Fargo, North Dakota in 1970. In 1971 his family moved to a small town in western Oklahoma called Burns Flat. After graduating as Valedictorian from high school in 1988 and as just 1 of 100 Oklahoma Academic All-Staters in the entire state, Noble attended Oklahoma Baptist University where he graduated with honors and a degree in Accounting with a minor in Business. After graduating from OBU in 1992, he then attended the University of Oklahoma College of Law and received his juris-doctorate degree in May 1995. He passed the Oklahoma Bar Exam in July 1995 and was sworn in as an attorney September 1995. He joined a local firm and was named a partner in the firm one year later. After several years as a partner, Noble formed McIntyre Law P.C. 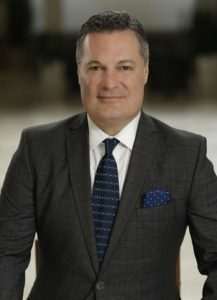 which focuses on representing severely injured clients across Oklahoma as well as nationally in connection with his Mass Tort Practice. In addition to Noble McIntyre, McIntyre Law has four other attorneys and multiple legal assistants and support staff in the Oklahoma office. McIntyre Law has also entered into strategic alliances with other firms nationwide which allows the firm to actively pursue cases on behalf of clients in states other than Oklahoma. Noble is married to Rhonda McIntyre. They recently celebrated their 23rd anniversary. They have 3 daughters: Mackenzie Hope (19), Cassidy Grace (18) and Kennedy Faith (14). In addition to his statewide practice representing catastrophically injured Oklahomans, Noble is currently representing clients nationally who were injured by the drugs Paxil, Xarelto and Zofran as clients injured by defective hip implants such as DePuy and Stryker. He also represents women badly injured by Transvaginal Mesh implants and Talcum powder as well as men and women injured by IVC Filters and Physio Mesh. University of Oklahoma College of Law, Norman, Oklahoma, 1995 J.D. Oklahoma Baptist University, 1992 B.B.A.